with carbon footprint data for 2012. Over the past year we’ve continued to use more renewable energy, squeezed even more efficiency out of our operations and helped our customers reduce their own IT footprint. In 2012 we emitted 1.5 million metric tons of carbon dioxide, before purchasing high-quality carbon offsets to reduce that footprint to zero. Our total carbon emissions decreased 9% compared to the previous year because we’re now deducting our green power purchases from our carbon footprint. We’re deducting these purchases according to new reporting guidance from the Carbon Disclosure Project. We continue to buy large amounts of renewable energy for our operations; to date we’ve contracted for over 330 MW of wind power in the US and Europe. For transparency’s sake, we’re also reporting our footprint without those purchases. We urge others to do the same, which is why we participate in the World Resources Institute Scope 2 accounting process. This helps to ensure greenhouse gas reporting remains transparent and meaningful. For the fourth year in a row, we’re emitting less carbon per million dollars of revenue. This means that our footprint is growing more slowly than our business because we’re able to get more done with each gram of carbon we emit. 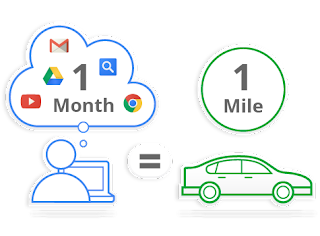 To put these numbers in perspective, we estimate that serving an active Google user for one month is like driving a car one mile. For this calculation, we assumed that an active Google user is someone who does 25 searches and watches 60 minutes of YouTube a day, has a Gmail account and uses our other services. To serve that user, Google emits about 8 grams of carbon per day. We’re also helping others reduce their carbon footprint. Research indicates that cloud computing is more energy efficient than traditional IT. This means that the five million businesses using Google Apps are reducing their IT energy consumption. Using the Berkeley Lab model, we estimate that their combined savings could add up to more than our carbon footprint. As we continue to drive down our emissions, we’re encouraged that our efficiency gains are translating into lower emissions for our users. We’ve just updated our Google Green site with carbon footprint data for 2012. Over the past year we’ve continued to use more renewable energy, squeezed even more efficiency out of our operations and helped our customers reduce their own IT footprint.